Our YooHoo and Friends keychain clip on plush Ruby The Red Fox is a fun way to take your favorite YooHoo Friend with you - clip it on a backpack, hang it on a belt loop, clasp it to a bag...the possibilities are endless! Measuring 3 inches tall, our plush Ruby The Red Fox is made of a velvety soft purple and tan plush with brightly colored eyes. Our plush Ruby The Red Fox dangles from a sturdy rotating clip. 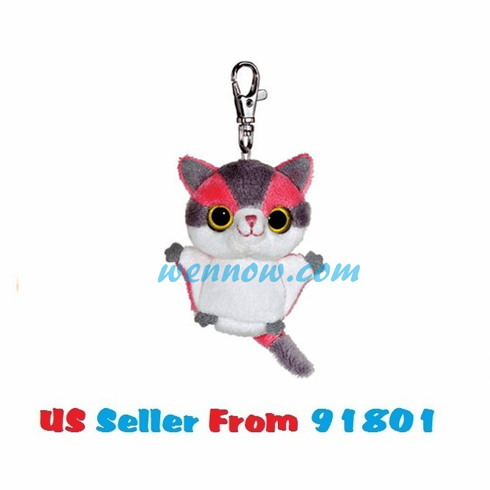 And, just like all of the quality plush YooHoo and Friends stuffed animals by Aurora, our 3 inch YooHoo and Friends keychain clip on plush Ruby The Red Fox is made of all new kid safe materials and meets or exceeds all US safety standards. Surface washable; recommended for ages 3 and up.